These aren't even the same character. Lucifer is a latin translation for morning star, which is speaking of a Babylonian king. Satan is not once called Lucifer in the Bible. Never said Lucifer was in the Bible that is many names ppl call him if you seen I said his true name is morning star. Do you mean the "Necronomican", as based of the Lovecraftian 'Cthulu' mythos? Minus 1000 credibility points, due to gullibility. Smart! You should know what I mean. This is a lesson about how we respond to things. Many things out there are more real and rational, but we always ignore them. And actually, this forum is the ouija board itself. And actually, this forum is the ouija board itself. So what - are you now trying to claim you weren't serious in the OP? Lucifer/morning star are also a reference to the planet venus. Satan in Hebrew is basically a term for an accuser/adversary. It was a mis-translation by the writer of the Latin Vulgate and picked up by the King James Bible. Isaiah was talking about the King of Babylon. Not a angel. Come on Piney. Don't you want to just summon him up and destroy humanity? Nope, just haunt all the lawyers and politicians. 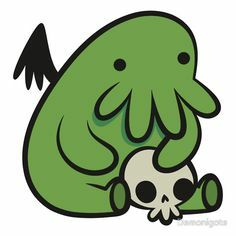 But, but, chibi cthulhu is so cute though.